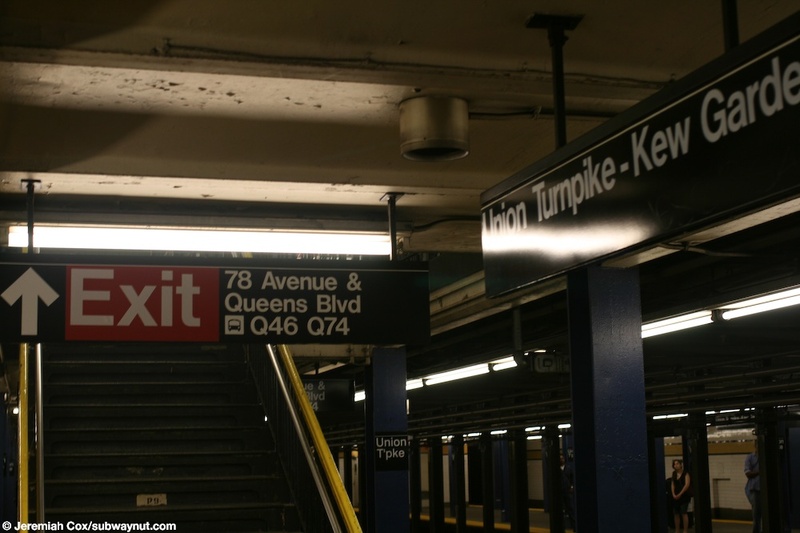 Kew Gardens-Union Turnpike has a very unusual design for an IND Express station, this is because the Jackie Robinson Parkway crossing directly under Queens Blvd smack over the center of the station platforms. 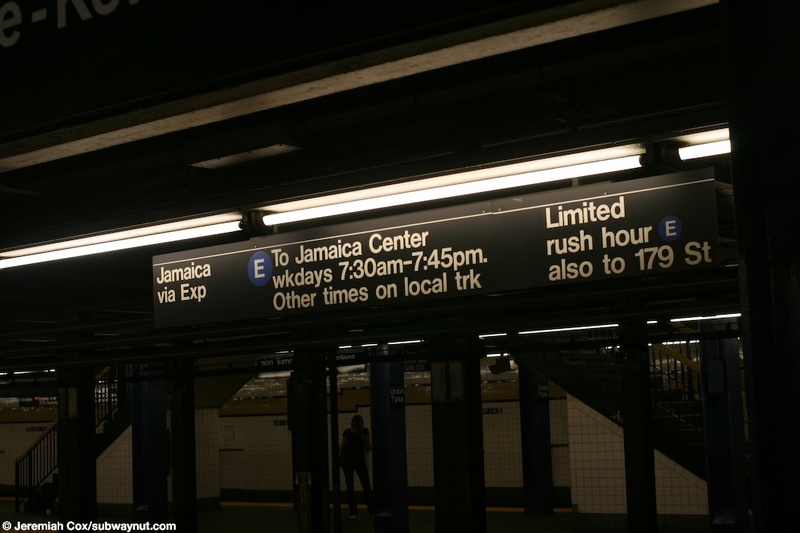 So the station has two fairly small (by IND standards) mezzanines towards each end of the platforms, one with various staircases out to 78th Ave and Queens Blvd, and the other to Union Turnpike at the eastern end of the station. Currently there is quite a lot of the blue under construction plywood covering parts of the station. 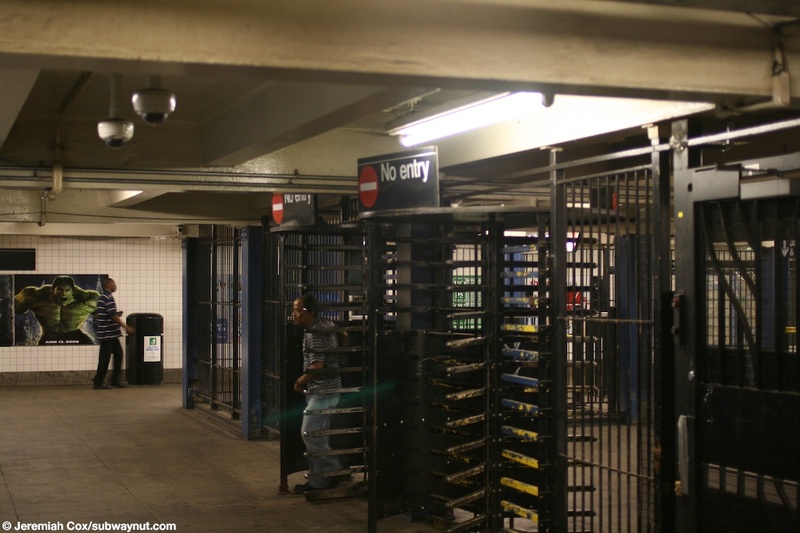 The station is currently becoming ADA compliant with new elevators being built to and from the two station platforms, as well as one down from street level to the mezzanine outside of fare control. The fairly long corridor that leads from the elevator landing (and a staircase to the street as well) is very modern and looks completely different than the rest of the station courtesy of the Arts For Transit (the installation is so new that I can't seem to find any information about it-please e-mail me if you know so I can add it). 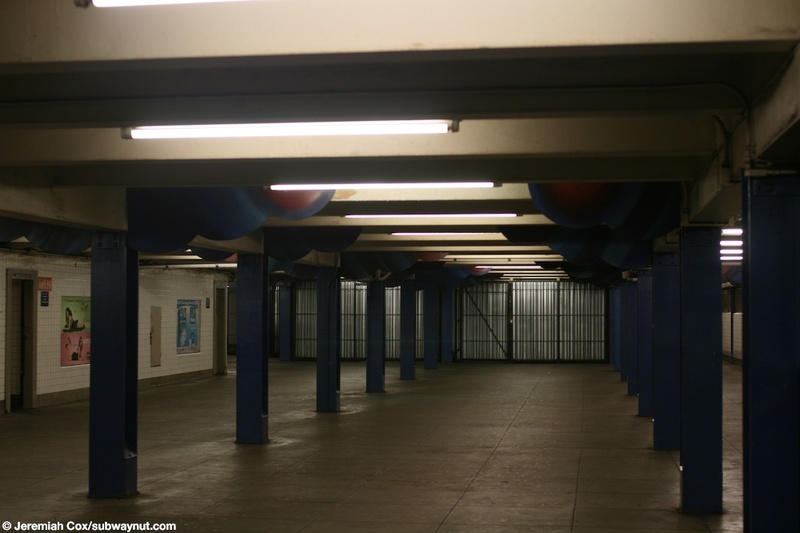 There are three space-age looking columns in the center of a portion of it where there is a small staircase that leads farther down towards the mezzanine, and an ADA Ramp that splits off from the staircase here for accessibility. 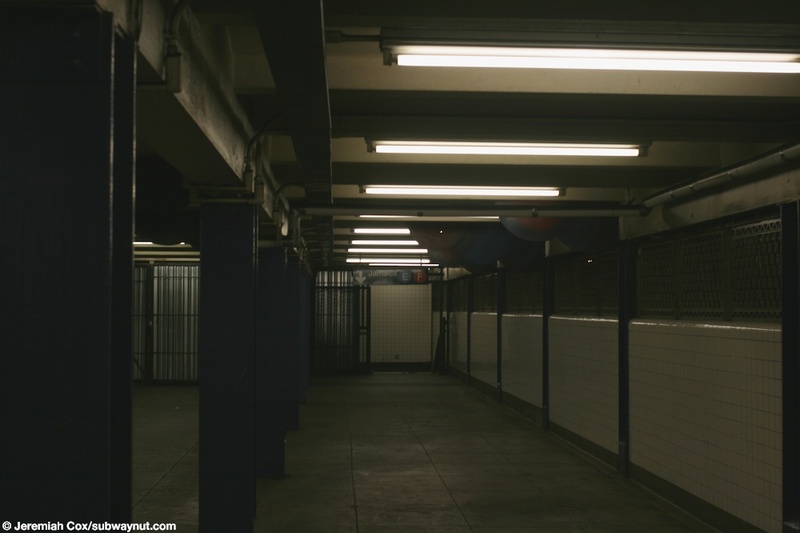 The walls of this area are made out of nice light colored rocks; there is also an opaque glass wall that provides a view of the Jackie Robinson Parkway going through its tunnel directly next to this passageway. A much more minor Arts For Transit installation exists on the 78th Avenue mezzanine, Underground Skies/Cloud Forest by Krystyna Spisak-Madejczy. 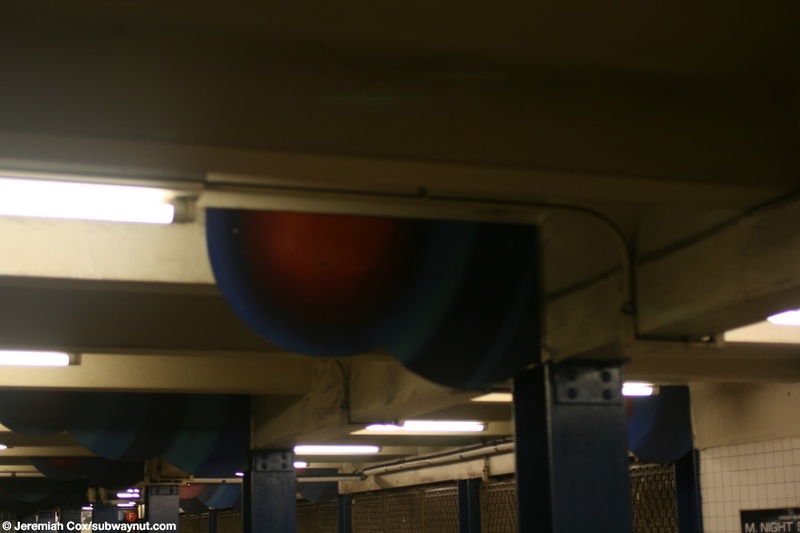 It consists of small very abstract looking blue with red dots in the center cloud like shapes that look like they are helping to hold the station columns up to the ceiling. 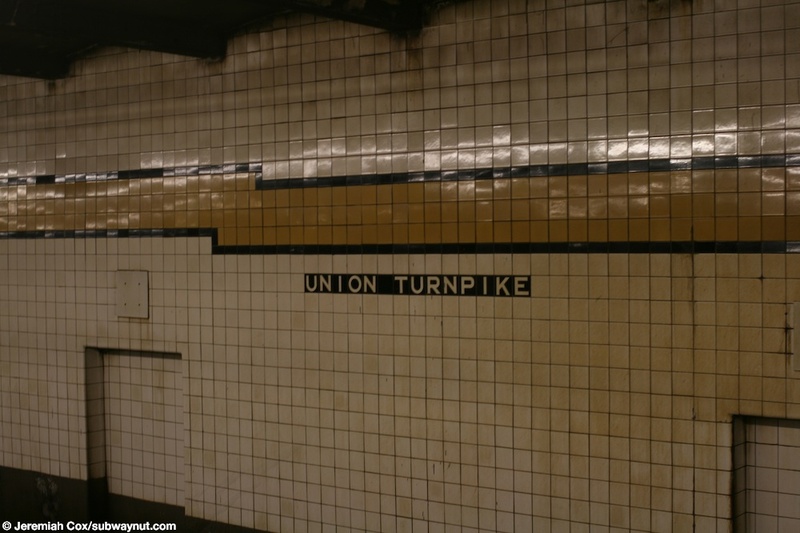 The platforms have teal blue columns, with yellow trim with a black border and Union Turnpike text underneath on the platform walls. 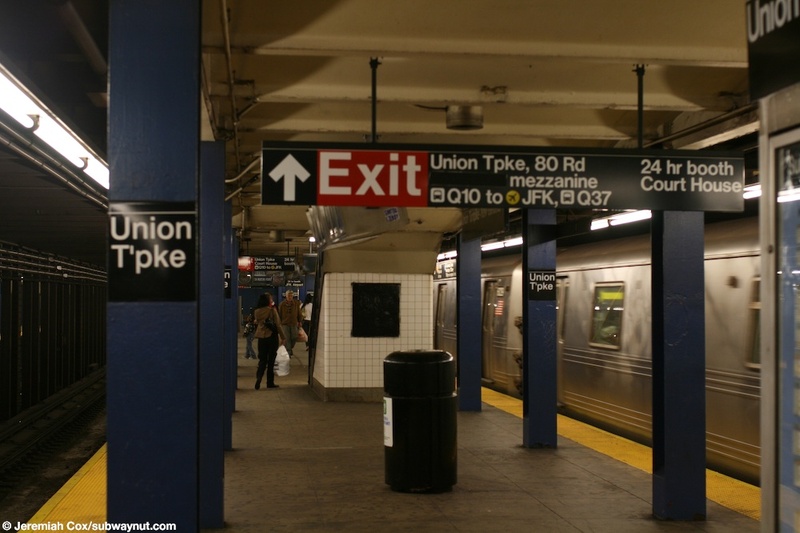 (unione1) The Union T'pke text is on most of the platform columns. 5 June, 2008 (unione2) Looking down the Queensbound platform at Union Turnpike. 5 June, 2008 (unione3) The Union Turnpike text underneath the yellow trim along the platform walls. 5 June, 2008 (unione4) Looking up at a hanging sign for Kew Gardens-Union Turnpike and a sign for a staircase up to the 78th Avenue mezzanine. There lots of signs in the station for the various connecting bus routes. 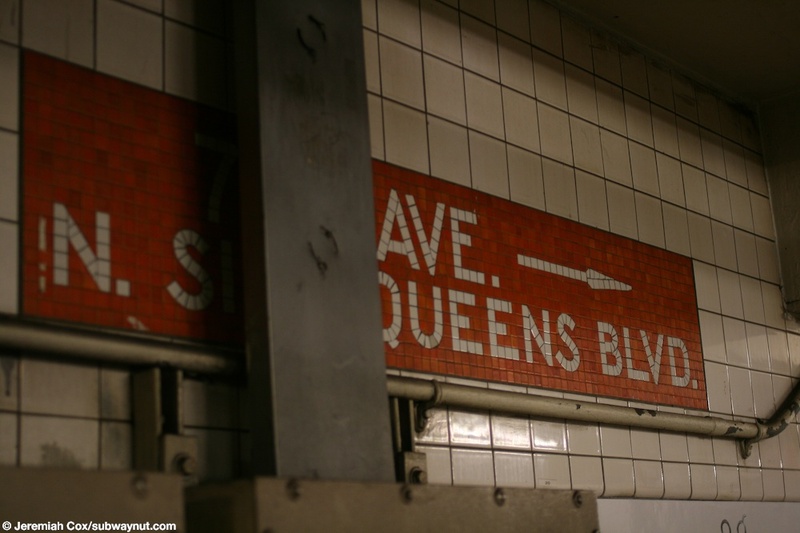 (unione5) The E train service sign on the Queens-bound express track, it says trains run express weekdays 7:30am-7:45pm, Manhattan-bound trains run express through here 6am-6pm, a big difference in timing. 5 June, 2008 (unione6) Looking down the 78th Avenue mezzanine at Union Turnpike, with the clouds of Underground Skies/Cloud Forest visible. 5 June, 2008 (unione7) A close up of Underground Skies/Clound Forest, the artwork is so abstract that its hard to focus a camera on them. 5 June, 2008 (unione8) Another view down the 78th Avenue mezzanine towards the farthest staircase down to the Jamaica-bound platform. 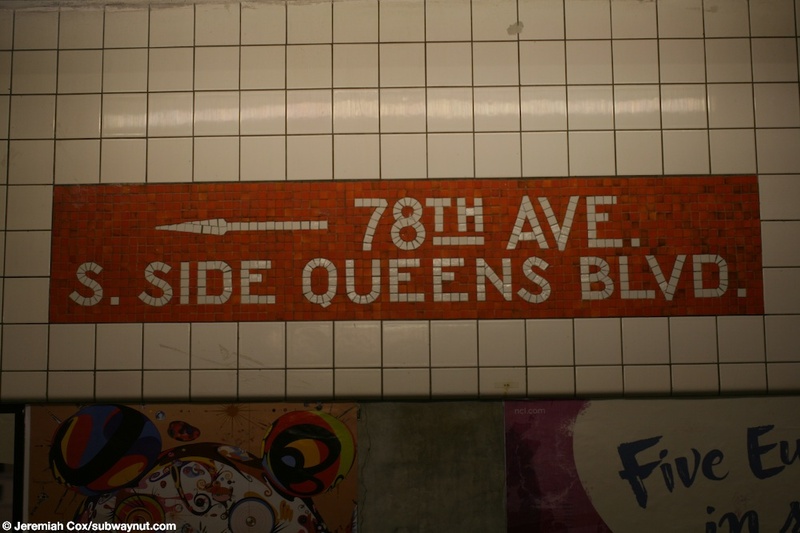 (unione9) A mosaic sign outside of fare control for 78th Ave-S Side Queens Blvd. 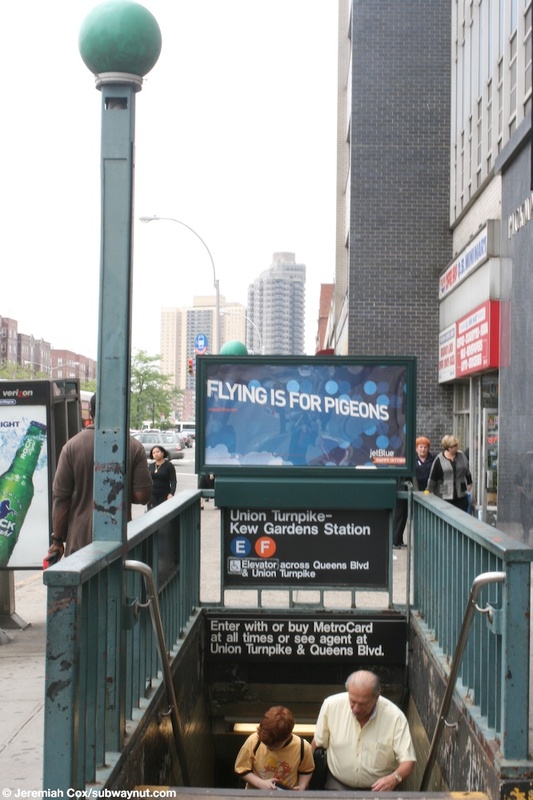 5 June, 2008 (unione10) A mosaic sign outside of fare control for 78th Ave-N Side of Queens Blvd that is now partally obstructed by a utility box. 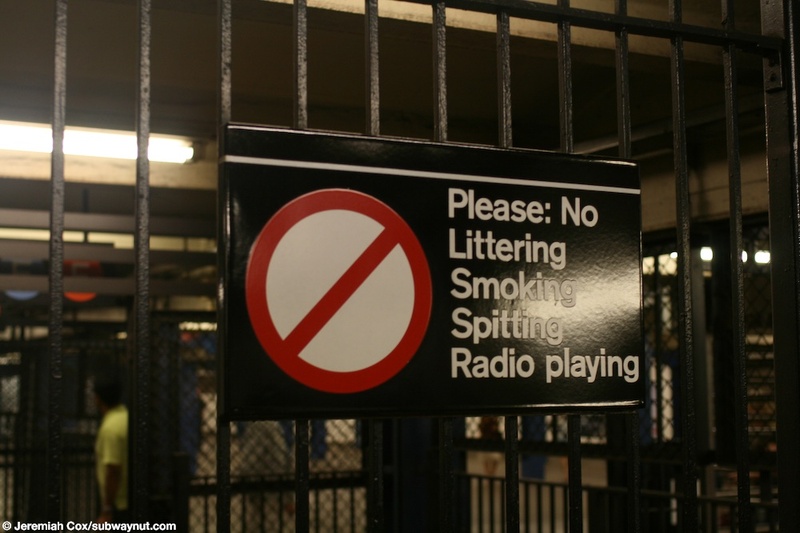 5 June, 2008 (unione11) A sign for Please: No Littering, Smoking, Spitting, Radio Playing at Queens Blvd. 5 June, 2008 (unione12) HEETs at the 78th Avenue entrance to Queens Blvd, the Customer Service Information booth is only staffed part time. 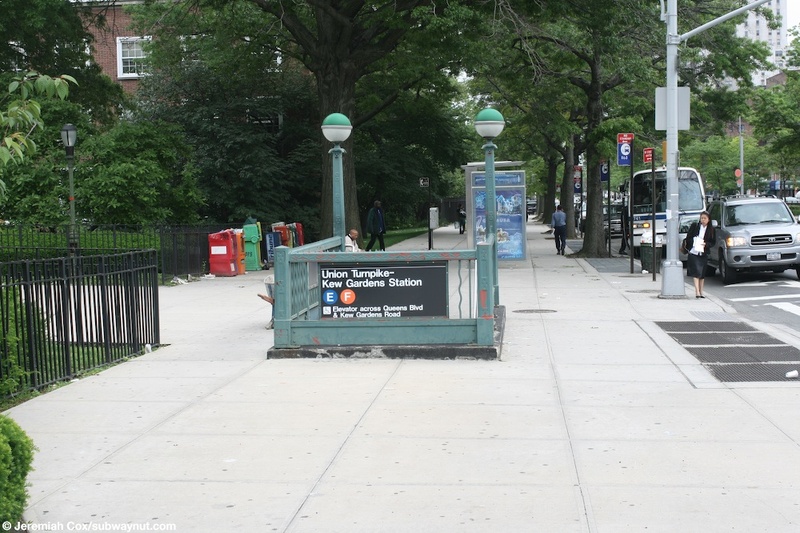 (unione13) A view of an regular entrance from street level down to Union Turnpike. 5 June, 2008 (unione14) A view of a different entrance staircase from street level at Union Turnpike. 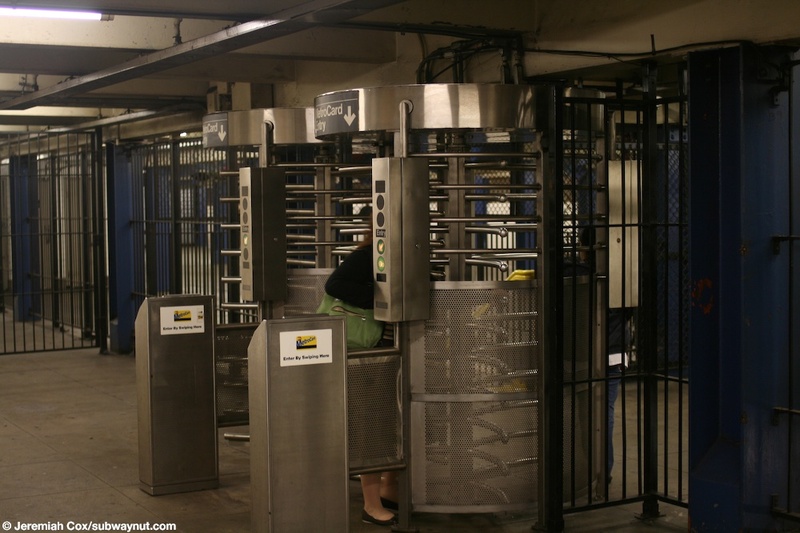 5 June, 2008 (unione15) High exit gates from the Union Turpike exit mezzanine, the turnstile is around the corner to be closer to the other two staircases down from the street here. 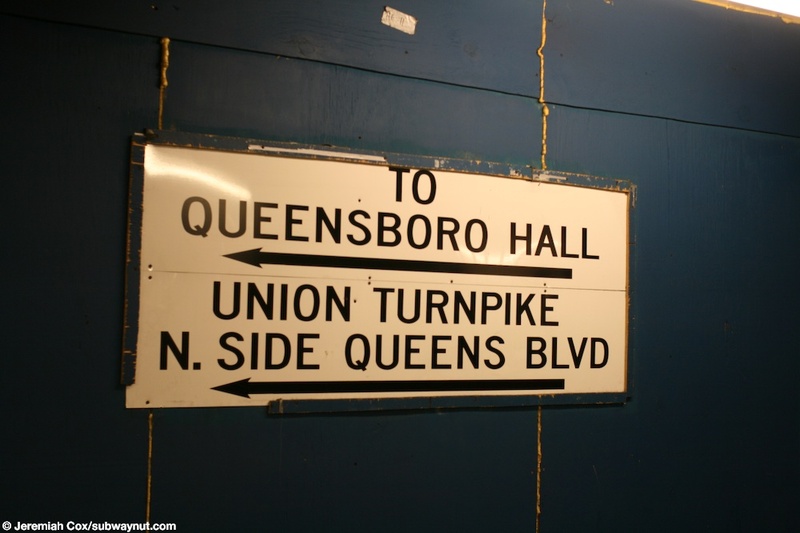 5 June, 2008 (unione16) Two white signs direct people to Queensboro Hall and Union Turnpike N Side Queens Blvd.